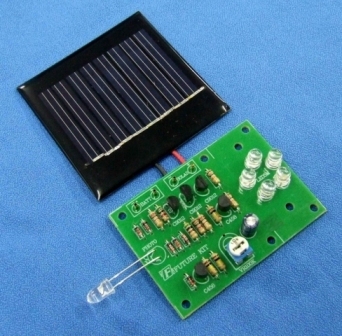 Kit includes the components and materials to assemble a Solar powered DC Electronic 5 LED Night Light. Five times the power of most single battery units available in discount stores. Adjustable sensitivity allows the user to select how dark it needs to be before the circuit turns on. A great project for beginners and seasoned circuit builders. Many uses and possibilities for use in other projects as well. Circuit board is 2.4" x 1.7"